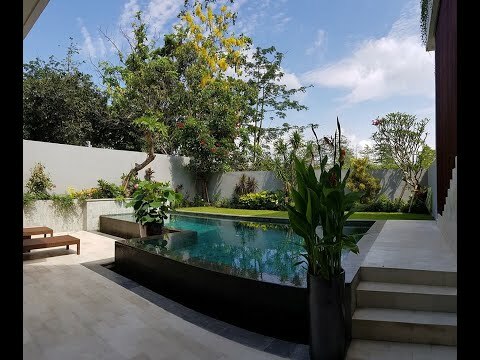 For sale beautiful freehold modern villa in a quiet area of Jimbaran, safe area in Puri Gading. The villa design is modern minimalist, blending the best of local open-plan traditions with the added benefit of being able to fully secure, when desired the living quarters through the closure of floor-to-ceiling, frameless, folding glass doors. Fixtures and fittings are of the top-most quality throughout and extend beyond the immediately obvious to the behind-the-scenes, functional appliances. The location is close to International School, Garuda Wisnu Kencana and Udayana University. 4 bedrooms with en-suite bathroom in each rooms. Include double door fridge, oven, dishwasher, microwave, stove, and hood.